As if the entire upper echelon of the U.S. government — essentially a for-profit corporation front for other mega corporations — isn’t so patently stinking corrupt the filthy, putrid reek of it probably extends into outer space, now this. 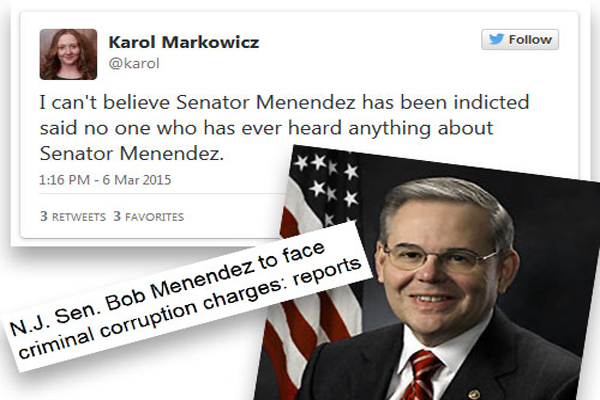 Menendez has denied any wrongdoing in his ties to Melgen. Undisclosed flights, huh? Woo hoo. Pretty lukewarm stuff considering the things our federal government is capable of. Then again, this is not exactly breaking news for anyone who knows anything about Senator Menendez, but that isn’t even the point. Who isn’t corrupt in Congress and D.C.? Could any of our elected federal officials really stack up to any other label than corrupt under a microscope? Can anyone find anything there that’s not corrupt by legal definition? Anyone? Anyone? Bueller? Bueller? Like Eric Holder isn’t corrupt. Pot calling the kettle black much? Last week, Menendez and Tennessee Republican Senator Bob Corker introduced legislation requiring President Obama to submit any nuclear agreement with Iran to Congress for a 60-day review. Back in January, Menendez also directly challenged President Obama at a Democratic Senate retreat when Obama claimed he understood the pressure Senators were under from “donors” (read: Jews). Menendez rose and told Obama he took “personal offense” at his remarks. Good for Bob Menendez for calling out Obama. But it will come at a price. I’m sure Menendez has now eclipsed Netanyahu as numero uno on Obama’s crap list. Well, having your Attorney General and closest political ally charge his own party’s top critic on any deal with Iran with corruption is one way to silence your critics. I’ve said it before and I must say it again. President Obama plays for keeps and anyone who gets in his way faces ruin.